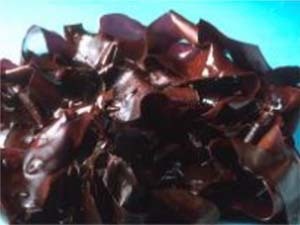 Dulse, also known as Dillisk, is a purple red seaweed. It grows on the northern coasts of the Atlantic oceans, and well known in the Irish tradition as a "salty" snack. Dulse is high in Vitamin B12 and Iron. Like other red seaweeds it contains Beta Carotenes, therefore very useful to prevent viral attacks. It is very useful to enhance flavour in fish recipes. When mixed with flour, baked in bread or mixed in hand made pasta, the taste will be totally neutralised.